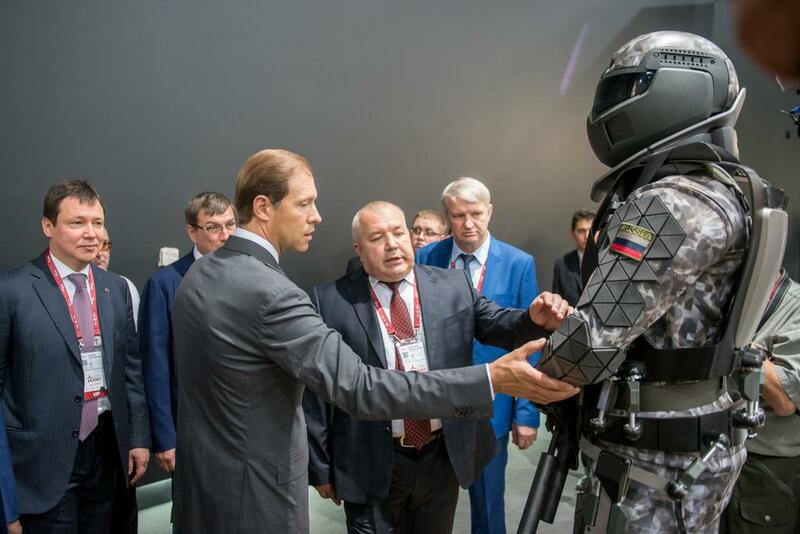 Russian minister of Industry and Trade inspects a Ratnik-3 infantry combat suit at Rostec's pavilion, Moscow. The advanced suit's chief designer compliment Ratnik-3 feature capable of resisting the effects of a nuclear blast..
During the ARMY-2017 arms exhibition at Russian Defence Forum on Expo of military technologies.The Russian companies’ officials who developed this project have revealed more details concerning Ratnik-3 project. 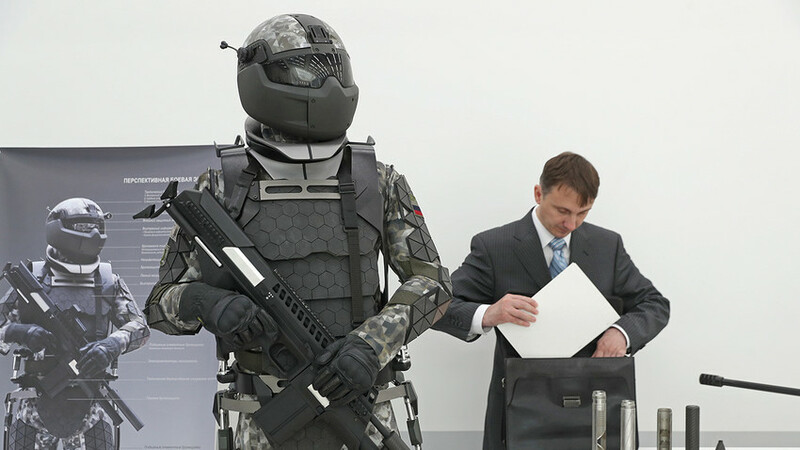 The latest addition to Russia's already futuristic upcoming combat uniform will reportedly help troops keep up with modern battlefield where biological, chemical,nuclear explosion and include acoustic weapons. The Ratnik-3 (meaning Warrior-3) is a third-generation infantry combat suit that incorporates a built-in exoskeleton and almost 60 different accessories in-one, including various late-model weapons, sensors and protective equipment designed to operate under nearly any conditions. The advanced gear's designers, who are affiliated with Russian state, the corporation Rostec, announced Tuesday that Ratnik-3 would also be fitted with a state-of-the-art capable of resisting water, shock and even radiation and electromagnetic damage.The helmet of Ratnik-3 will be equipped with an advanced aiming system. It will automatically calculate the distance to the target as well as all the variables like the wind speed and direction, the temperature of air etc. Having the projectile ballistics data, it will calculate the point of aim. Russia made a breakthrough in futuristic combat uniform that will help troops keep up with modern battlefield environment where biological, chemical,nuclear explosion and even acoustic weapons, will become a norms of war. The Ratnik-3 (meaning Warrior-3) is a third-generation infantry combat suit that incorporates a built-in exoskeleton and house multiple accessories in-one, including various late-model of weapons, sensors and protective features that designed to operate under any natural terrain. So all the soldiers will work in synchronicity simply to match the point of aim with the target and pull the trigger at once. It will also have a “corner shooting” possibility allowing to shoot from cover without exposing the shooter himself. Besides providing protection for eyes and ears, the helmet will also have a built in gas mask. In case of hazardous elements detected in the air, it will automatically activate the gas mask. The helmet will allow the soldier to control various unmanned vehicles in the field as well as receive and send data to other soldiers and command centers for rescue or reinforcement. It will also continuously collect data concerning soldier’s health status and be able to electrically stimulate the soldier’s brain if needed, in case a soldier feeling drowsy. One of the officials said that the body armor will be able to withstand more than ten hits of different bullets. Well, this statement makes more questions than gives answers. What caliber and type of bullets it is rated for? The exoskeleton it better than those existing types of armors and levels of protection, probably. The Ratnik-3 suit will be covered with a special compound which will be able to change its color depending on the background thus becoming an active camouflage.The exoskeleton will be one of the most important features on Ratnik-3. The weapon system incorporated will be a combination of an assault rifle and grenade launcher. The grenades will be self-guiding “fire-and-forget” type. Unfortunately, there are no details concerning the weapon itself. Watch the video below for further explanation: Oleg Faustov, a chief designer at the Central Scientific Research Institute for Precision Machine Engineering, a part of Rostec, said in a press statement, according to state-run Tass Russian News Agency. "The level of technology and the reliability of the elements of servicemen’s outfit is growing due to the eminent exposure to battle contamination and fatigues. Correspondingly, the level of a soldier’s capabilities on the battlefield is amplified technologically by this special uniform. This new development by Central Scientific Research Institute for Precision Machine Engineering is another step in this direction," Sergey Abramov, industrial director for Rostec's Armament Cluster, added. Russian New Generation Combat Suit Ratnik-3 is already exist! Behold the Russian Army of Future! The first generation of Ratnik system prototypes was reportedly distributed to selected units in 2013 for the purpose of testing the warrior cloak and was spotted by The New York Times being worn by unmarked Russian units in Crimea shortly after Moscow annexed the former Ukrainian territory in 2014. In January 2015, the Russian Defense Ministry announced its first shipment of 50,000 kits for later that year, according to The Moscow Times, and, by November 2016, RIA Novosti reported that all Russian naval units were to be outfitted with Ratnik systems, which included bulletproof and floatation vests. The head of the Russian army, Colonel General Oleg Salyukov, said last week the latest inception of the "soldier of the future" outfit would see action by 2022, weigh 30 percent less than previous models and substantially increase soldiers's abilities to complete missions. "We are completing the scientific research on creating the future layout of the Ratnik-3 combat gear. The implementation of the project will allow to increase the performance of a soldier by 1.5 times in completing various tasks," Salyukov told Russia Defense Ministry newspaper Krasnaya Zvezda in comments translated by Tass. The final appearance of the Ratnik-3 will be shown by the end of this year again, and the entire production will probably be issued in 15 to 20 years.